Wright State student Jeremy Lee and Ohio State student Jeff Blanford explain their team's micro air vehicle at the 2012 Summer-at-the-Edge Open House. Humanoid robots, virtual reality, 3D printed unmanned aerial systems, cybersecurity, surgical simulations, plus sensors and smartphones. Research projects on these and other topics will be unwrapped for the public during an open house of the Discovery Lab’s Summer-at-the-Edge program. The Aug. 8 event will be held in the Apollo Room of the Wright State University Student Union from 1 to 4 p.m.
Wright State biomedical engineering students Brittany Fouts, Monica Leslie and Michelle Bricker explain their SMARTCare project to Wright State student Michelle Harr at the 2012 Summer-at-the-Edge Open House. The Discovery Lab is a partnership between the Wright Brothers Institute and the Air Force Research Laboratory. Summer-at-the-Edge brings together students from high school to college to work in the lab’s high-tech environment hosted at the Tec^Edge center in an intense collaboration on a specific challenge or opportunity. The open house will serve as a showcase for demonstrations and posters from over 100 student interns who performed more than 30 research projects with government, industry and university partners. 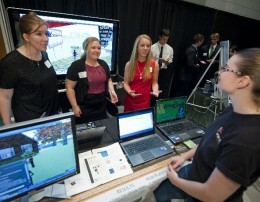 The open house will also feature the introduction of Discovery Lab’s 1,000 Student Grand Challenge. 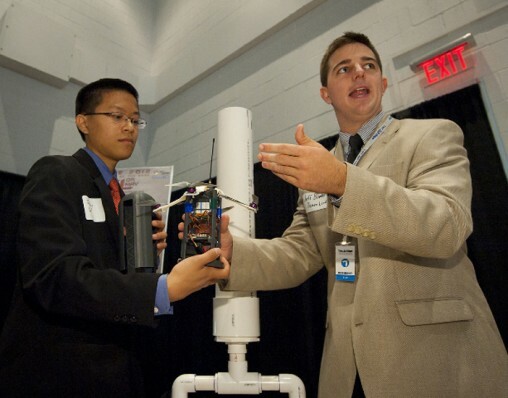 The Challenge is a call for teams of high school students to compete during the 2013-2014 school year for funding support for entrepreneurial research projects that tackle technology challenges of interest to the Air Force and offer the potential of technology transition and commercialization. Some of the student finalists will be awarded research internships in the 2014 Summer-at-the-Edge program.